ATTENTION: The post you are about to read does not contain anything pumpkin spice or talk about leaves falling or feature pretty boots and sweaters. It's fall in Texas, Y'all! This means 6 more weeks of summer. We should have something akin to Groundhog day for Texas but with an armadillo to make light of the fact that we have to still run the A/C, we are still drinking ICED coffee (and the ubiquitous tea) and still wearing shorts and flip-flops. Don't get me wrong, I truly LOVE summer and all these things attached to it. I really don't get why everyone loves Fall since it is signaling that the coldest, dreariest time of the year is coming around the bend, but I know there are lots of people out there that truly do get giddy when the "PSL" is re-introduced each year. Pumpkin anything just doesn't taste right until the daytime temps are in the 60s at the highest and we are far from that. 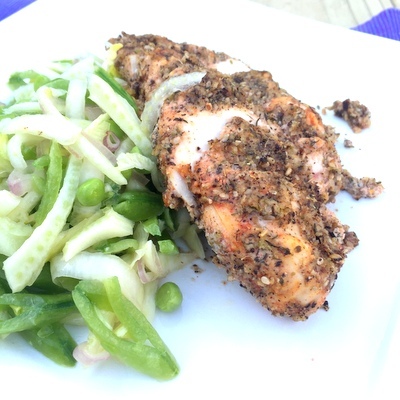 This Za'atar Chicken with its earthy flavors is the best I can do to nod to fall. The bright green color and flavors of the accompanying salad bringing in the summery component that complete my food-centric interpretation of Autumn in Texas. As you may have noticed if you have been reading this blog for awhile, I am transitioning from gluten-free to grain-free. I have come to find out with testing and working with a PA at my doctors office, that my body works much better without grains of any kind. I have also recently started The Whole 30 diet which further eliminates dairy, soy, alcohol and sugar. This meal in fact is a perfect example of the goodness I have been eating for the last 3 weeks (yes, I am 5 days away from ending my "30"!!!) With this transition, I have been learning how to use nut flours instead of grain based flours that are common for gluten-free diets. What I've learned is there truly aren't good substitutes for flour-based baked goods like a chewy baguette or the perfect pizza crust, but then there are things that, without an ounce of wheat or even rice flour, turn out amazing like this Za'atar chicken! I've used almond flour and coconut to crust chicken, but with this self-contained blend I don't have to season the flour or dredge in egg first. Just pat it on and cook! In arabic, it actually means "thyme" but most people recognize the word as a delicious dry condiment that originated in the Middle East where the herb grows wild on the hillsides. Dried thyme and sesame seeds are the main components with sea salt and sumac making up the remainder. Since the thyme originally used was wild and most people don't have access to the wild version, many use oregano or marjoram to replicate the native flavor (although most of us wouldn't know what that was anyway, right?). You can decide if you want to make it more complex. My recipe is very simple with only four ingredients. The hardest part of making this blend is finding the ingredients. The best place to buy spices in general is at a well-stocked grocery store that has a bulk foods area. If you live in a major city, Whole Foods is your friend (or in Texas, Central Market, also). Natural foods stores also have bulk bins and usually a spice area. Bulk spices are WAY cheaper than buying the little plastic bottles and definitely cheaper than the name-brand glass ones. But if that's all you have, then go with it. You can also use fresh thyme for this recipe if you can get ahold of fresh herbs in produce. If you're making za'atar, mix together all ingredients well in a small bowl. Brush chicken on both sides with the oil then press the Za'atar onto all surfaces of chicken. Heat more oil in a large skillet over medium heat until shimmering. Saute the chicken for 3-4 minutes per side until no longer pink (or better yet until 160 degrees on a n instand read thermometer. Remove the fennel stalks and fronds. Peel and thinly slice the shallot and place in a small bowl with a pinch of sea salt and some warm water to remove the bite. Going against the grain of the gennel, thinly slice on the diagonal and add to a large bowl. Salt well using about a teaspoon of sea salt. Massage well to break down the fennel a bit. Let sit for 5-10 minutes. Add the sugar snap peas and the shallots (drain first). Whisk the lemon zest and juice with the olive oil then pour half over the vegetables and toss well. If salad is dry, add more dressing. Season with more salt if ncessary. Save remaining dressing to either serve over chicken or use on another salad.